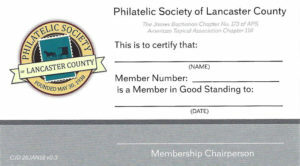 The Philatelic Society of Lancaster County (PSLC) is an award-winning, non-profit community organization dedicated to promoting stamp collecting as a hobby for education and fun. The PSLC began as the Lancaster Stamp Club in March 1923 with fifteen charter members meeting in the Science Building at Franklin & Marshall College. The PSLC is the James Buchanan Chapter of the APS #173 and Chapter #118 of the American Topical Association. For a more detailed history, visit the Society Archive. A Stamp Collecting Club for the teenager to adult; from beginner to postal historian. Serving members from Lancaster, Lebanon, Reading, York, Harrisburg, Hershey and beyond. 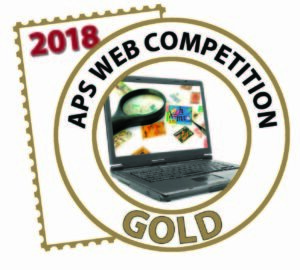 Monthly Full Color Newsletter: packed with a wide array of interesting topics on stamps and postal history. Monthly Meetings: programs with live speakers presenting interesting and fascinating stamp collecting and postal history topics. Great Q&A sessions always follow. Buy/Sell Bourse: you have sessions to buy or sell stamps, covers and accessories to fellow collectors before, during and after the Meeting. Auctions: three times a year you have the opportunity and participate in a Club Auction. LANCOPEX: our Annual Two Day Show includes Invited Dealers, a U.S. Post Office Mail Station, Daily Show Cachets, Stamp & Postal History exhibits, plus Members Exhibit FREE! Convenient Meeting Location: Landis Homes, Crossings Meeting Room, 2nd Floor, 1001 East Oregon Road, Lititz, PA.
Meeting Dates/Times: The second Wednesday of the month (except Aug. & Dec.) at 7:00 PM. Why not Join Us, fill in the Membership Form and send it to us today!